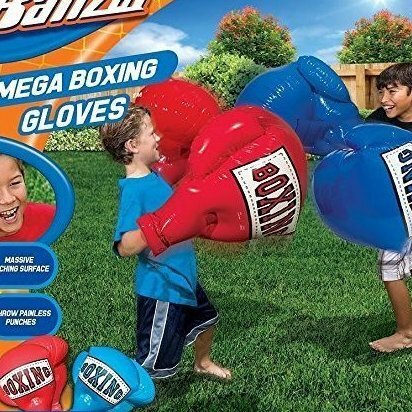 Throw fun, harmless boxing matches with these Banzai mega boxing gloves!. Set includes 1 pair of red or blue mega-sized inflatable boxing gloves. With these inflatable boxing gloves, it's easy to land painless punches on your opponent. Gloves measure 26" L x 18"W x 14" H. Recommended for ages 5+.